Sometimes the best ways to comfort someone are the simplest. Like bringing them a steaming mug of tea when they need a break, or just a chance to sit down and talk. 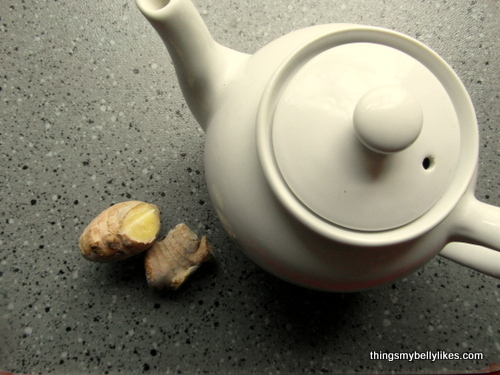 In light of the restorative power of tea, and the many cups I’ve had this week, it seemed a good time to share this recipe with you. I actually created it for my ma-in-law who is addicted to the ginger tea they serve at her local Asian restaurant. I was trying to get that reviving combo of spicy and sweet just right…and I think I nailed it. The key here is using frozen ginger. I bought it fresh from the supermarket, peeled it and then froze it for a few hours until hard. Obviously, this is a lot of trouble to go to for tea but I highly recommend storing your ginger in the freezer for everything – in my experience it’s much easier to grate that way. 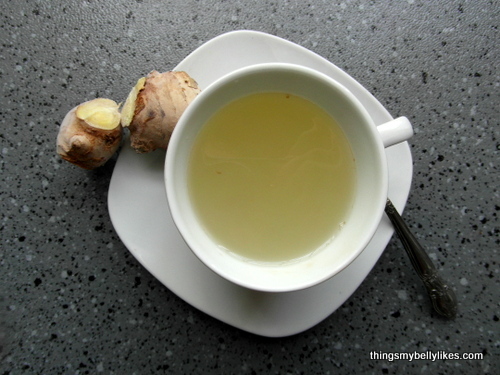 In a small saucepan, pour the boiling water over the ginger and lemon zest. Cover and let steep for 5-10 minutes. Strain, then stir in the honey and serve.